Your New Jersey attic can be the ideal breeding ground for mold. Conditions like excessive heat, high humidity, or roof leaks can provide enough water to cause and sustain mold growth. Attics tend to suffer from ventilation and insulation problems. These problems can obstruct air circulation and allow moisture buildup. If you detect signs of a potential mold problem in your NJ attic, a certified attic mold removal professional will be able to safely and effectively assist you. Mastertech’s attic mold removal experts in NJ are trained to identify if your attic has a mold problem and develop a safe and effective attic mold removal solution. Once your attic is clean and safe, we’ll make recommendations for preventing mold from returning in the future. What Causes Attic Mold in New Jersey? A thorough attic mold inspection, completed by a professional mold inspector in your NJ area, will determine if mold problem exists, how bad it is, what caused it, and how to properly remedy the mold and the moisture source. Visual Assessment – Your MasterTech Inspector will complete a comprehensive visual analysis of your NJ attic to identify any conditions that could be causing and sustaining mold growth. Moisture Mapping – Your inspector will carefully map out the damp or wet areas of your attic to determine where the water starts and stops and how many areas it has affected. Moisture Meters – Your mold inspector will use moisture meters to read the moisture content of building materials in your attic. Moisture locked within porous building materials go unnoticed for a long time. Thermal Imaging – Thermal imaging cameras are used to detect temperature differences between wet and dry building materials. Your inspector will be able to identify all wet areas and the mold growth pattern. Attic Mold Testing – Surface and/or air quality samples will provide scientific data that will confirm or deny the presence of mold, how much mold is present and what species of mold are present. Report of Findings – Your Mastertech inspector will develop a detailed, easy-to-read report that outlines what the inspector did, what he/she found, and what to do next. If necessary, your inspector will present you with a detailed scope of work for a safe and effective attic mold removal. The NJ attic mold removal experts at MasterTech Environmental are thoroughly trained and equipped with the necessary knowledge, skills, and tools to safely address your attic mold removal needs. Your Mastertech mold inspector will develop the safest and most efficient scope of work that properly addresses your specific mold problems. This will ensure that your attic mold is properly removed and prevent future recurrence. At Mastertech, each technician on our attic mold removal team must undergo intensive technical and safety training to ensure that they are ready for the job. With our focus on quality control and safety, you can be sure that we will provide you with the safest, most effective and most efficient attic mold removal services possible. We strive to exceed client and industry standards by going the extra mile to get the job done right. Call 609-948-8844 today to ask about attic mold removal services in your area. We will be happy to answer all your questions and schedule you for an appointment with one of our certified professional mold inspectors. 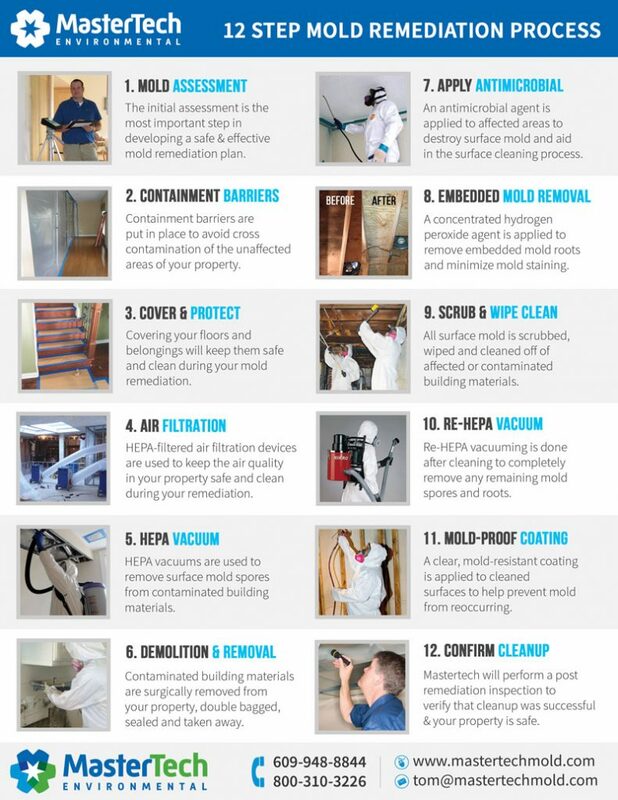 In addition to attic mold removal, Mastertech Environmental also provides the following mold services: basement mold removal NJ and crawl space mold removal NJ.